Please Note: The above link does not work in this post. Nurse Lauren Barclay spends her entire life running interference for her wild-child sister, Jessica. She returns to Houston after a brief hiatus in Austin because of her sister's escalating problems. Physician's Assistant and single dad to cute Emma, Elijah Landry is at odds with his father. The threat of a restraining order does nothing to stop his vigilant care for his disabled older brother. Mounting family tensions and a hurricane make any chance of a relationship seem like an impossibility. 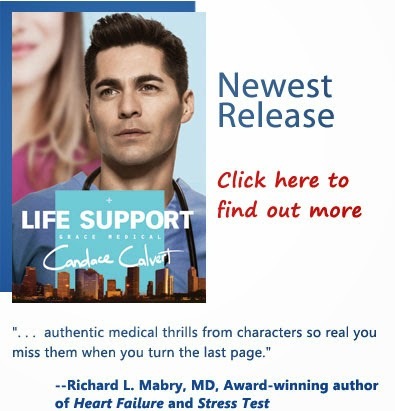 As in real life, Candace shows how people's actions reflect their past and can entrap them. There are no pat, easy answers in this book. Each character struggles through their conflicts in real time. In my opinion, the storyline and characters all rate 5 stars. I loved the sweet father/daughter duo and their Newfoundland dog, Shrek. Even the characters offstage add color to this intriguing story. Disclaimer: I won this book in a blog contest. I was not paid or asked to give a favorable review. All opinions expressed are mine alone.